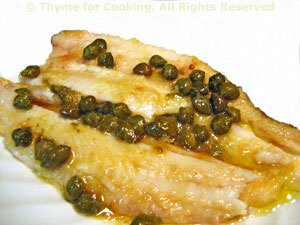 Sole with Browned Butter and Capers, Thyme for Cooking gourmet main course. Sole is a delicate fish with a mild flavor that pairs well with lemon and capers. It's normally served with the tail and bones intact: just skinned and cleaned but not filleted. They cook very fast and if you are not careful when you take them by the tail to turn them over the skeleton will come away in your hand. The flesh comes away easily with a fork to eat. Or, even better, buy them skinned and filleted. Put the flour and paprika on a plate large enough for the fish to fit. Mix with a fork until combined. Over medium-high heat melt the butter in a nonstick skillet large enough to hold both fish. When butter is sizzling and just starting to color dip both sides of fish (hold it by the tail) in flour and add to pan. Sauté 1 - 2 minutes on each side depending on size of fish. When lightly browned and done remove to plates. Add capers, wine and lemon juice to skillet. Quickly stir, loosening and browned bits. Serve with 2 lemon quarters to squeeze over top. Note 1: You can cook them slightly underdone, to this point, then put them on a platter, cover them loosely with foil and put in a 200F (100C) oven to keep warm. Note 2: If you get sole filets, they will cook even faster. Use a long spatula to turn them carefully.